Working with Indian mythology seems to be in the new trend with most Indian authors and even though most writers are adding their own spin to it, you can’t really deny that original stories of Ramayana and Mahabharata have a charm of their own. This was probably identified by Anuja Chandramouli when she penned down Arjuna- Saga of the Pandava Warrior Prince. When you pick up the book, the cover does give you an impression that it belongs to the genre of the mythological thrillers, but just like Forest Of Stories the book is actually re-telling the story of Mahabharata as told by Veda Vyasa. The only twist here is that it concentrates on the life of Arjuna, the third Pandava prince. Each event pertaining to Arjuna’s life, major or minor has been included in the book without meddling with the original story of Mahabharata. 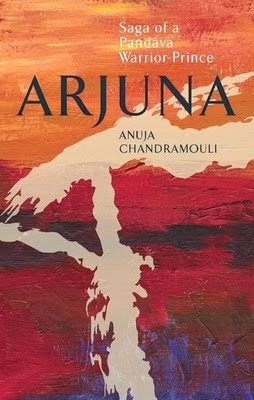 The book even begins like Mahabharata where Janmajaya, the great grandson of Arjuna requests Veda Vyasa to tell him about his ancestors and Veda Vyasa in turn asks his disciple,Vaishampayana, to narrate the epic poetry that is Mahabharata to Janmajaya. Narration is a little confusing at times. I would have definitely appreciated a more systematic narration as it will just make it very easy to follow the story but I do know that in Mahabharata everything is interlinked and thus giving a systematic narration is a very difficult task so all I can suggest is that if you are reading the book, be prepared to move from past to present to future to past and so on. Language is one of my biggest concerns whenever I read anything remotely related to mythology as its very easy to pen down big words but for me they just ruin the flow of the story as obviously I can’t look everything up in a dictionary every now and then . Anuja however kept the language pretty straight forward and also included a Sanskrit glossary at the end of the book for the reader’s convenience. The only issue that I have with book is the fact that it just ended abruptly. As I mentioned the story began with Janmajaya requesting Veda Vyasa to tell him about his ancestors, there was no mention of him when the story ended which kind of rendered the beginning of the book useless. I wish the author had give some kind of a closure to this story as well. Overall, I did like how the author did not meddle with the facts or tried to fill any gaps in the story of Mahabharata because as I said, they have a charm of their own. I do wish the ending was not this abrupt however you can’t really take away the credit due for all the research she did and the beautiful way in which she presented it and thus I’ll give this book an 8/10. Disclaimer: I was sent the book for review purpose however the opinion expressed is honest.